to add some color and fragrance to the house. 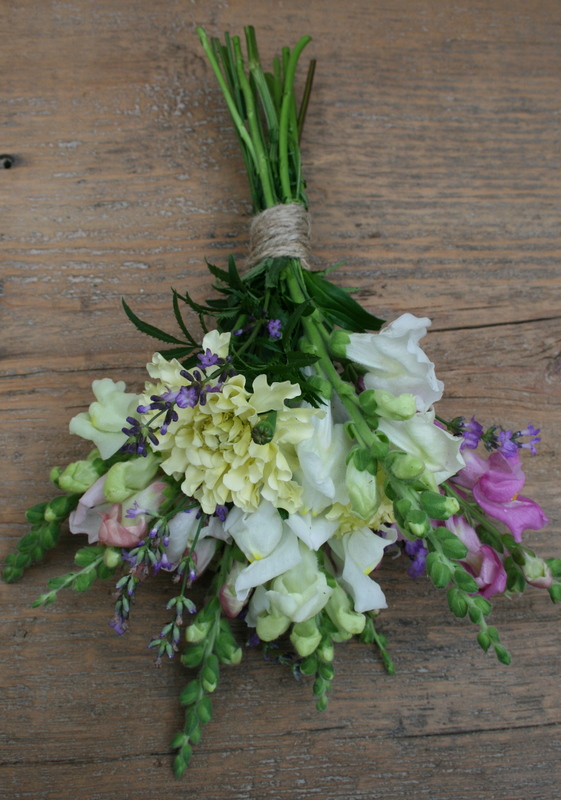 Snapdragons, French Vanilla Marigolds, and Lavender sprigs. You have reminded me to to grow snap dragon next year, thank you for the flower reminder ! I think I will try staking them next year–to get nice tall ones! They do smell so nice! This would make a lovely bridal bouquet! Gorgeous and I particularly love the French Vanilla Marigolds. I’m not normally a fan of the orange ones which can look a little garish but those are beautiful. Will have to see if there is a supplier over here. I have never seen this see before either. They are quite large plants now, and they smell very sweet, not at all like “regular” marigolds. I’m going to try to save seeds…not sure if it will work or not. I agree with Laurie that this would be a lovely bridal bouquet. I also do not especially like marigolds, but the French Vanilla, lovely. Are they scented like vanilla? They smell very sweet, not like a regular Marigold at all. I think I picked up the seed at Fleet Farm this Spring? My little bouquet is adding some color to my little desk. Beautiful!! It takes talent to put together flowers like that. I really just gathered them and tied them together! I am just thrilled to have some pretty flowers to enjoy, despite the long hot Summer. We need rain! So glad you enjoyed the picture!